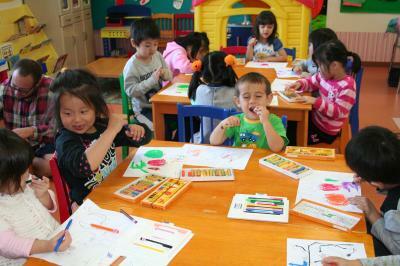 Today at study time we practiced counting and spelling. 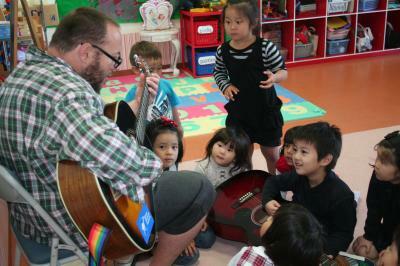 Today our teacher taught an easy guitar lesson. Then he played Halloween songs on his guitar for us to sing. We love singing! Here we are doing shared reading. We do shared reading twice a week. We learn many useful things at Apple Bee! Today we held a birthday party for our October Birthday Boy. We sang happy birthday songs and heard his mother tell birthday stories. We also made banana pancakes. YUMMY! Today we made scary skeletons. We have many Halloween decorations in our classroom. Today we practiced reading, writing and drawing shapes in our workbooks. 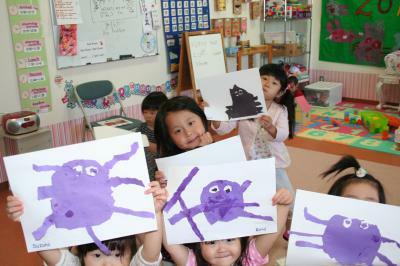 Today we made scary spiders. BOO! 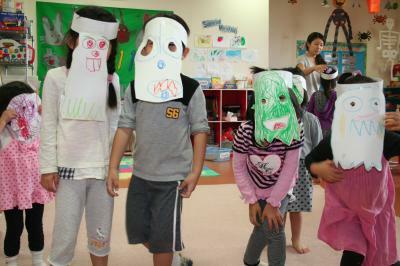 In honor of Halloween, today we made scary ghost masks! Today we played a Halloween game we call “Pumpkin Patch.” We made cute little pumpkins out of paper and placed them all on one table. Then we took straws and used air from our lungs and mouths to pick them up. The object is to move the pumpkins to another table without dropping them. Pumpkin Patch is easy to make and fun to play. A great game for taking a break from study at school, and for playing at Halloween parties. 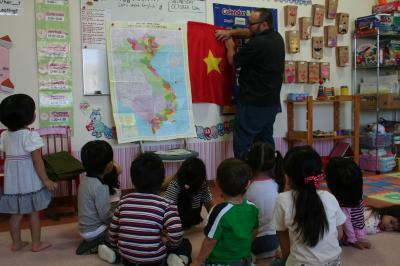 Every month we study about a foreign country, and this month we learned about Vietnam. 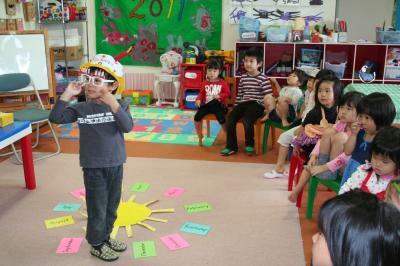 Our teacher showed us a map and told us about the climate, food and music of Vietnam. 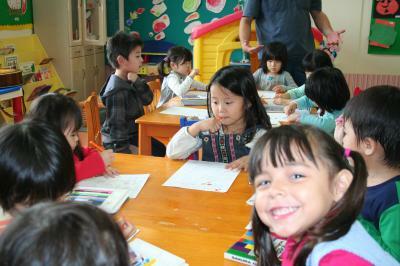 We like learning about foreign countries and the way people live throughout the world. 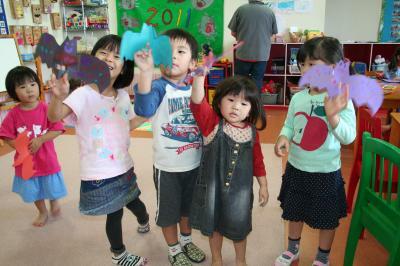 This month we are having a Halloween Party. Today our teachers taught us the “Knock, Knock, Trick or Treat?” song. 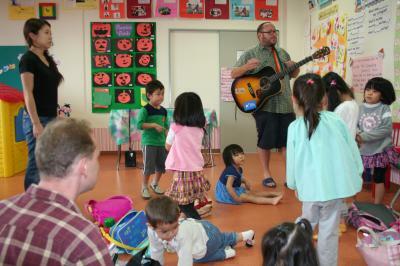 We enjoy singing and dancing to our teacher’s guitar.You should try it! Today at project time we glued shiny, colorful shapes and letters on to colored construction paper to create beautiful collages.You should try it. Today we made scary Halloween bats to fly around our classroom. Be careful! 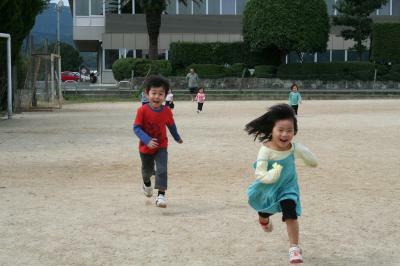 Autumn is here and it’s time for excersing outside!